One Step 4Ward - Dream Big. Travel far. Live Full. Oh, and I've traveled to every single country on the planet as I've blogged. Now I'd love to teach you guys how to 'Dream Big. Travel Far. Live Full'. If I can do it, so can you! Hey guys and girls, I’m Johnny Ward, a normal Irish guy who just knew that there was more to life than a 40+ hour work week, a bland social calendar and a year spent saving for that one 2 week break in the sun. No thanks. Not for me. 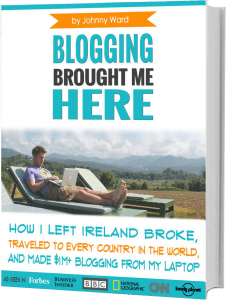 My FREE Ebook - "Blogging Brought Me Here"
My journey has been a crazy one. 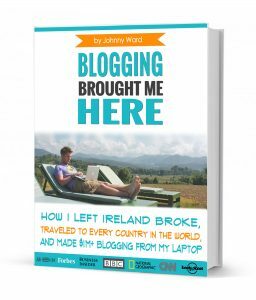 From growing up on welfare and benefits in Ireland to becoming a millionaire from blogging in a short space of time, sometimes it doesn’t even feel real to me. I changed my life, and now it’s pretty awesome so I really want to show other people how following your passion, and doing what you love, is the only way to live your life. I created a free ebook to chat about my story a little more in depth, so you can see I’m for real. The second half of the book though, that’s where the value is. Blogging changed my life, and it can change yours. There are super simple chapters on how to start your very own blog (travel, fitness, anything! ), how to make your blog popular, how to get free stuff (hotels, clothes etc), and how to make money blogging. It’ll help you get started, and set you on your way. Any questions, just drop me a message. Wanderlust? Where Do you Want To Go? Click and Read!